By carrying a smart key, you can lockand unlock the doors and start the hybridsystem. For locking the doors, see “Locking thedoors with smart function” on page 30.For unlocking the doors, see “Unlockingthe door(s) with smart function” on page31. For starting the hybrid system, see“Push button start system” on page 138. If the smart key battery is discharged, thesmart function cannot be used. Use themechanical key attached to the smart keyby inserting it in the driver’s door keyholeto lock or unlock door. To start the hybridsystem, insert the smart key into the keyslot. In order to activate the smart function,the battery should be replaced. Fordetails, see “—Replacing battery” on page38. You can deactivate the smart function byusing the cancel switch. In this case, allthe smart function will be deactivated. Fordetails, see “Deactivating the smart function”on page 34. Be sure to take the smart key withyou. When facilities issuing strongelectromagnetic waves such asTV towers, electric power stations,broadcasting stations arenearby. When you are carrying a smartkey together with a mobile communicationssystem such as atwo−way radio or cellular phone. When the smart key is in contactwith or covered by a metallic object. When another person is operatinga wireless remote control functionon another vehicle near yourvehicle. If you do not drive your vehicle,store the smart key, keeping it atleast 5 m (16 ft.) away from the vehicle. People with implanted pacemakersor cardiac defibrillators should keepaway from the smart entry and startsystem antennas, because the radiowaves may affect the operation ofsuch devices. For the antenna locations,see “ANTENNA LOCATIONS”on page 26. Users of any electrical medical deviceother than implanted pacemakersand implanted cardiac defibrillatorsshould consult the manufacturerof the device for informationabout its operation under the influenceof radio waves. Radio wavescould have unexpected effects onthe operation of such medical devices. If necessary, the smart function canbe disabled. See “DEACTIVATINGTHE SMART FUNCTION” on page34. Your vehicle is equipped with alarmsinside and outside, as well as warninglight in the instrument cluster, that remindyou if there is a problem involvingthe smart entry and start system. This warning light will come on when the“IG−ON” mode is enabled and will go offafter a few seconds. If an alarm sounds or the warning lightcomes on, be sure to check your vehicleand smart key. (a) The hybrid system was not turnedoff and the transaxle was in a positionother than “P”. When the driver’s door is opened with thehybrid system in “ACC” or “IG−ON” andwith the transaxle in a position other than“P”. (b) The smart key was brought outsidethe vehicle with the transaxle in aposition other than “P”. 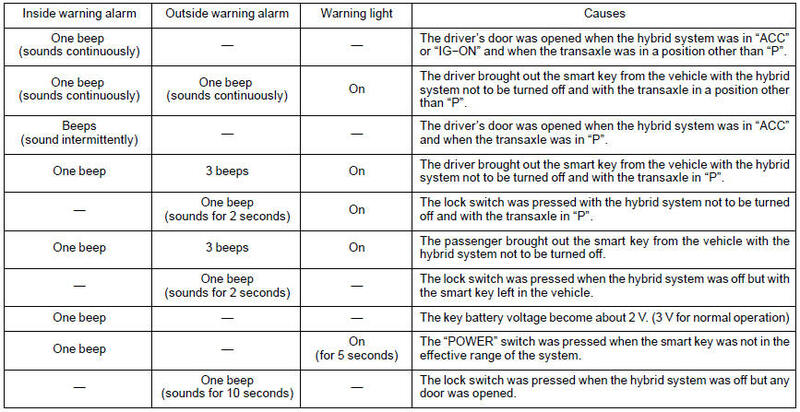 When the driver’s door is opened orclosed with the hybrid system not to beturned off and with the transaxle in aposition other than “P”, it is determinedthat the smart key is not in the vehicle. (c) The hybrid system was not turnedoff with the transaxle in “P”. When the driver’s door is opened with thehybrid system in “ACC” and with thetransaxle in “P”. In the “IG−ON” mode, an alarm will notsound. (d) The smart key was brought outsidethe vehicle. When the driver’s door is opened orclosed with the hybrid system not to beturned off (and with the transaxle in “P”),it is determined that the smart key is notin the vehicle. (e) Locking with smart function was attemptedwith the hybrid system notto be turned off. When you attempt to lock all the doorsusing smart locking function with the hybridsystem not to be turned off and withthe transaxle in a position other than “P”. At this time, the doors cannot belocked. (f) The smart key was brought outsidethe vehicle. When a door other than the driver’s dooris opened or closed with the hybrid systemnot to be turned off, it is determinedthat the smart key is not in the vehicle. When you close the door with the hybridsystem off but with the smart key left inthe vehicle, and attempt to lock all thedoors using smart locking function, it isdetermined that the smart key is in thevehicle. This function may not operate whenthe smart key is left on the instrumentpanel, luggage cover, floor orin the glove box. The function may operate if thesmart key is brought outside but itis very close to the door window ordoor handle. When the hybrid system is turned to“ACC” or “OFF” about 20 minutes afterthe hybrid system is turned on or to “IG−ON”, it is determined that the smart keybattery voltage is low. When the “POWER” switch is pressed, itis determined that the smart key is not inthe vehicle. When you attempt to lock all the doorsusing smart locking function with the hybridsystem turned off but with any dooropen. The smart entry and start system willlock the doors without being insertedinto the door keyhole. When you exit the vehicle carrying thesmart key and push the lock button on theoutside front door handle or back doorwith all the doors closed, all the doors willbe locked provided that the electroniccode in the key corresponds to the registeredID code for the vehicle. At this time, you will hear one beep andthe turn signal lights flash once. However,when you push the lock button on theoutside front door handle or back doorwith any door not closed securely, a beepsounds for 10 seconds. If the key is in the vehicle, do notperform door locking operation, oryou might lock your keys inside thevehicle. The rear doors are not equippedwith smart function. When locking the doors, be sure topush the lock button on the outsidefront door handle or back doorslowly and surely. If you push thebutton quickly, the doors may notlock. When opening or closing a door, donot touch the lock button on theoutside door handle or back door. Ifyou push the button, an alarmsounds 10 seconds. When a wireless remote control isused to lock the doors and a smartkey is left in the effective range ofthe smart function in the vehicle,the doors cannot be unlocked usingthe smart function. In this case, usethe wireless remote function to unlockthe doors. You cannot activate smart unlockingfunctions within 3 seconds after thesmart locking function is activated. be used to unlock the door(s) withoutbeing inserted into the door keyhole. When you get close to your vehicle (about1 m (3 ft.) from each outside front doorhandle), and are carrying the smart key,the electronic code emitted from the keyis automatically checked to determine if itcorresponds to the registered ID code forthe vehicle. When you take hold of theside back of the outside door handle surface,it will unlock. At this time, twobeeps sound and the turn signal lightsflash twice. When you push and hold down the backdoor opener switch, carrying the smartkey, the ID code is checked in the sameway as in the front door case. And all thedoors will unlock. At this time, two beepssound and the turn signal lights flashtwice. When you get close to your vehicle (about1 m or 3 ft. from either front door), carryingthe smart key or unlock the back doorusing smart key function, the interior lightcomes on for 15 seconds if the interiorlight switch is in the “DOOR” position.However, the interior lights go out whenyou push the power door lock switch inthe lock position or press the “POWER”switch once or twice from the off settingto select the “ACC” or “IG−ON” modewithout depressing the brake pedal. Forfurther information, see “Interior lights” onpage 115. You have 30 seconds to open a door afteroperating the smart unlocking function. Ifa door is not opened by then, all thedoors will be automatically locked again. When unlocking the door(s), be sureto take hold of the back side of theoutside door handle firmly asshown in the illustration. Takinghold of the handle with a glovedhand might cause a delay in unlocking. When you take hold of the handleor push the back door opener tounlock the door(s), be sure to confirmthat the door(s) have been unlocked.If the two beeps and theturn signal lights flash twice, thedoors are unlocked. At this time,you can pull the outside door handleor push the back door opener toopen the door. If you quickly movecloser to the vehicle or pull the outsidedoor handle or push the backdoor opener quickly, the doorsmight not unlock. If you cannotopen the door by pulling the outsidedoor handle or pushing theback door at this time, push backthe outside door handle to the originalposition or release your handfrom the back door and then tryagain. If you bring the smart key veryclose to the outside door handle orthe back door opener, the doorsmight not lock. If another person who is not carryinga smart key takes hold of anoutside door handle or push theback door opener when you arewithin the effective range of thesmart function, the door(s) may notunlock. If a large amount of water is appliedto the outside door handle orthe back door during heavy rain ora car wash, and someone carrying asmart key is near the vehicle, thedoor(s) might be unlocked. However,if the outside front door handle isnot pulled out or back door openernot pushed, the doors will lock automaticallyafter about 30 seconds. To ensure the unlocking door(s),perform unlocking operation within3 seconds after getting close to thevehicle (about 1 m or 3 ft. from thefront doors or back door). If ittakes longer than that, unlockingfunction may not be enabled. 1. Driver’s door unlocking mode: If youperform smart unlocking operation onthe driver’s door, it will unlock. Performingunlocking operation on thefront passenger’s door or back doorwill unlock all the doors. When thesystem switches to this mode, onebeep sounds inside the vehicle and twobeeps sound three times. 2. All doors unlocking mode: Performingsmart unlocking operation on eitherfront door or back door will unlock allthe doors. When the system switchesto this mode, one beep sounds insidethe vehicle and two beeps sound twice. 3. Single door unlocking mode: Thedriver’s door or back door on whichyou perform smart unlocking operationwill unlock. However, performing unlockingoperation on the front passenger’sdoor will unlock all the doors.When the system switches to thismode, one beep sounds inside the vehicleand two beeps sound once. When changing the mode, be sureto push both lock and panic buttonsfirmly, or panic alarm may beactivated. This operation will not change thewireless remote control unlockingfunction. In the single or driver’s door unlockingmode, if you get into thevehicle from the driver’s door carryingthe smart key, all the smart unlockingcontrols activated by thesmart key will be stopped for security.If you get out of the vehiclefrom the driver’s door carrying thesmart key and get out of the effectiverange of the smart function,unlocking control by the smart keywill be possible. However, unlockingcontrol may not be carried out for5 seconds after you get out fromthe vehicle. In this case, operateunlock control again after 5 seconds. When doors are locked, the smart entryand start system transmits electromagneticwaves to the outside of the vehicle atregular intervals. For this reason, the vehiclebattery will be discharged if the vehicleis left for a long time. If the key isleft within the effective range of the smartfunction outside of the vehicle, the keyand the vehicle transmit electromagneticwaves periodically. If these conditions continuefor a long time, the battery in thekey and vehicle will be discharged. (a) Press the lock button on the outsidefront door handle or back door whilecarrying the smart key. (b) Perform a wireless remote control operation. (c) Insert and turn the mechanical key inthe keyhole of the driver’s door. To maintain communication with thevehicle, smart keys use built−in batterypower. The battery service lifeis about 1 to 3 years on average. Ifbattery power becomes insufficient,replace the battery with a new one. The smart key continually receiveselectromagnetic waves, and if it receivesstrong electromagnetic wavesover a period of time, the batterycan be drastically run down. Therefore,avoid storing smart keys nearany electrical appliances. Note that you should always keepsuch electrical appliances at least 1m (3 ft.) away from the smart key. 1. Smart function is on. 2. Smart function is off. The cancel switch for this function islocated at the bottom of the instrumentpanel on the driver side. When youpush the switch, the smart function willbe deactivated. Pushing the switchagain will reactivate the function. When the smart function is deactivated,use a mechanical key or wireless remotecontrol function key to lock and unlock thedoors. To start the hybrid system, inserta smart key into the key slot. If you do not intend to drive your vehiclefor a long time, push the cancel switch todeactivate the smart function. The cancel switch is turned on. The smart key is inserted into thekey slot. The battery of the smart key is discharged.